Tips & Treasures: Coupon for a FREE bottle of Coffeemate! Coupon for a FREE bottle of Coffeemate! 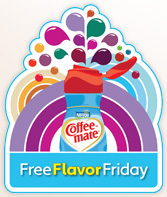 Get ready to claim your coupon for a free full-size bottle of Coffeemate! They are giving away 100,000 coupons on their site and on Facebook this Friday, Feb 4th, starting at 9am PST. I'll be sure to post a reminder Friday morning! Don't miss any of my freebie finds... consider subscribing or following Tips & Treasures through Google Friend Connect, Twitter or Facebook. Thanks!